Oh sure, there are probably a bunch of different routes that could win the prize of being the most overserved these days, but I think there’s one in particular that deserves the win. Surprisingly, it doesn’t even have that many flights, but even one flight is too many. It’s a route that former President Bush might call the Axis of Evil Express. Any guesses? That’s right. It’s Caracas, Venezuela to Tehran, Iran. And it’s about to get even more service. The Chavez to Ahmadinejad connection is 7,315 miles long. That’s only 150 miles shorter than LA to Sydney, in comparison. While they’re both oil countries, it would seem that the biggest reason for operating this flight is because almost nobody else outside of Cuba wants to be their political friends. Having demand for the flight appears to be optional. The flight first launched in 2007 and today it’s operated weekly by Conviasa, the national airline of Venezuela, on an early model (1993 vintage) A340-200. It’s also codeshared with Iran Air. You might wonder how an A340 can make a flight that far, right? Well I’d think they’d have a shot at making it since there are probably only two people on every flight, but they don’t take the chance. It stops. Remember how I said that almost nobody wanted to be political friends with these guys? Yeah, well the plane stops in Damascus. Syria is one of the very few exceptions, unsurprisingly. But now let’s get to the really comical news. Those crazy cats in Venezuela and Iran are at it again. They’ve recently signed an agreement that, among other things, will provide new “direct” flights between Tehran and Caracas thanks to Mahan Air. Mahan does have a 747-400, so I imagine this could actually be flown nonstop. I guess that will help take the pressure of Conviasa so they can carry more local traffic between Caracas and Damascus. I’m sure they’re just bursting at the seams trying to carry everyone right now. So… Do we know how much money these people lose daily? HHMMM…do we have any hard numbers? And to think in the ‘glory’ days of flying THR used to have daily 747 service on PanAm on their round-the-world flight (PA001/002). Is Iran starting a nitch market of air service to places who’s leaders don’t like the USA? Sadly, I think it’s going to be incredibly difficult to find hard numbers. Maybe somebody out there has been counting passengers. Next stop, North Korea . . .
Did you know that Iran Air serves the Tehran-Caracas route (with a quick fuel stop in Damascus) using a…wait for it…747-SP?? Load factors are well under 50%, obviously. Love it! Keep ’em coming, Cranky. There was an investigative program on the BBC a few months ago about Chavez’s connection with Ahmadinejad and attempted to delve into the trading relationship between the two countries. They interviewed some Iranian students that were hanging around Caracas and hoping to find a way to the US, I assume they came over on that flight. There also seemed to be a fairly active trading relationship so I would presume that there might be a bit of cargo. Actually, I hear they run the route because the Spring Break business alone pays for the rest of the year. Hmm, what about the loop flights over the Antarctic? I mean no one lives there and it gets flights.. This is the best blog ever….makes my day every time! Oh, to fly the totalitarian skies! What’s sad is that in the 1970’s, Iran Air was consistently recognized as one of the best international carriers. In 2000 I flew Iran Air from Heathrow to Tehran. Somewhere over Turkey I had a nervous breakdown that led to a tick that I suffer from to this day. I think you will eventually have to fly over Russian airspace and to do so you have to pay handsomely. I think Emirates is the only airline that has that sort of an arrangement with the Russians but I could be wrong. Did you know that Iran Air serves the Tehran-Caracas route (with a quick fuel stop in Damascus) using a…wait for it…747-SP?? I think that’s done now. It looks like the Conviasa A340 is being flown instead – it might even be a joint venture between the two. Too bad. You can still fly that 747 SP from Beijing to Tokyo – I’m always tempted to get on one before they go away. There are so many hilarious pictures running through my mine right now . . .
Well, there’s something to see on that route. Looks like the Caracas to Damascus flight just sits over water the whole time. That is an AWESOME report. Thank you for linking. Why the stop in Damascus? Well, from the looks of the trip report JM included, it’s probably to help them build up to a 10% load factor. You don’t mention, do they actually have daily service? If not this might actually be reasonable, if those guys do do business with each other. I’m sure it would make sense once a week (in an A340, not so sure about the 747). You don’t mention, do they actually have daily service? I mentioned that the current Conviasa service is only weekly, but I don’t know what the new one will be. Even once a week is too much in my eyes. Reminds me of the less-than-weekly Aeroflot IL-62 flights to Latin America and Africa from the late 70s-early 80s that would seemingly hop around countries randomly and have technical stops up the wazoo. Somewhere on youtube there is a great TV ad for Iran Air. I’d be willing to fly the route just to be on a 747-SP again, only did one flight (CPT-JNB-FRA), and it was way cool. Wasn’t aware of this route. Thanks for sharing the information. Hopefully it works out for them — time will tell. Tried to book this flight – Kayak didn’t return it as a hit :(. I can think of other over-served routes – mainly involving various 737 types transporting people who didn’t buy a ticket, traveling to places they don’t want to go to……………. The yields will be off the charts……. Better strategy than adding another DFW/IAH/ORD/DEN to XYZ because a competitor did! Cranky! Im just completely shocked (actually Im not) by your biased American nonsense, spread throughout this article. Regardless of what Americans think, or like! Tehran and Caracus are in bed with each other, and have every right to link both capitals. Millions of people live in both countries, and so of course it makes sense to have direct or nonstop service between them! That you can state that this route is over served is just silly and reeks of sheer ignorance on your part! If one person flies it, and the governments of these two countries, wish to prop up the service, thats up to them! That your post ridicules these countries and its people, should make you ashamed of your biased reporting skills!. Albeit, its still a blog, but nonetheless! I would like to think that Im suffering from jetlag, and misread your post, but its doubtful. DL is adamant at all costs to WIN NYC in 2010……haha, same nonsense! Tehran and Caracus are in bed with each other, and have every right to link both capitals. Millions of people live in both countries, and so of course it makes sense to have direct or nonstop service between them! You’re right. They have every right to link both capitals. It doesn’t mean it’s a good idea. Just because you have millions of people doesn’t mean they want to go to every country on earth. They also are highly unlikely to be able to afford it anyway. There are plenty of ways to get from Tehran to Caracas via connections, and that’s how those cities should be linked. Wait, did you work for Alitalia? Sure, governments can throw away money all they want. Hell, we pay over $100m per year in taxpayer funds in the US for service to small towns that probably shouldn’t have service. It’s still a waste of money. There is a HUGE difference between the American example and the Caracas-Tehran one. With American, the end goal was to win the significant business that exists in New York. There is a ton of business, and those are short term competitive moves to try and win in the long term. For the Caracas-Tehran route, there just isn’t a market. This isn’t a competitive move at all, and there’s no hope of long run success. It’s just a political, flag waving move. As the above link to the trip report on airliners.net shows, the route, when initially operated by the Iran 747SP, attracted a lot of attention from enthusiasts. Even a major German daily had a full page article on it. Apparently Iran Air crew really went to great lengths to provide great service given the limitations of 1970s hardware. All ideological issues aside, it is amazing how Iran Air manages to do this. Agree with you totally, mate. US airline industry still believes it is the best in the world, when clearly it is not by most measures and unfortunately the attitude of CF on this one is likely prevalent throughout the management and boardrooms of the US. I think the response you got sums it up perfectly! 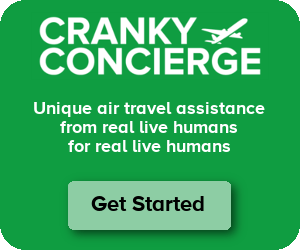 While Cranky’s initial entry didn’t provide any proof, the real proof is in the Airliners.net trip report. If a flight that is flown once a week on an A340 has 24 passengers on it, something is wrong. If anything there is a US Businessman bias by expecting hard numbers. The fact is that probably wouldn’t happen because its embarrassing. The trip report makes its really clear: This route is overserved. I don’t think that Cranky is trying to make a political point here (though he does acknowledge, correctly, that this route exists almost purely for political reasons, and that isn’t a secret). He’s simply noting the novelty of the fact that this route exists and that, even with service only once per week, load factors are comically low. Nobody is knocking the passenger’s right to fly the route, nor are they denying that there is a very small target market that does benefit from this service (since, as you mentioned, Venezuela and Iran do plenty of business together). However, to make this into a US vs. the world argument or to use this as an opportunity to call out what you may believe is some sort of uniquely American ignorance is, in my opinion, just silly. I think the ignorance here is on the part of the governments propping up this service. Of course everyone knows, thanks to the example of oil rich places like Iran, Venezuela, and the Great State of Alaska, when you’re flush with oil revenues you can waste as much money as you like on whatever you like, and sit back secure in your thinking thinking the rest of the world really must be laughing about something else. Which All-737 Airline Is Installing In-Seat Video?